Good work on the winged figure! I took your advice and played around with it. It looks like a native winged madonna to me. There seems to be a ball of energy over the Child's head. The Heart ley from the Ramah heart links with Jackson Hole in the Tetons (Heart chakra of the Ascension Grid) goes through Ship Rock or "Rock with Wings" in Navaho. Ramah in Hebrew meanis to "rise up, exalt self", among other things. PURPOSE? Concerted mental focus can create a grid form. This one seems to be an interface for a number of sites in the US South west, linking to the vital 4-Corners and using a Native format. (The 2nd Longest Walk by all the Tribes/Nations is now enroute.) 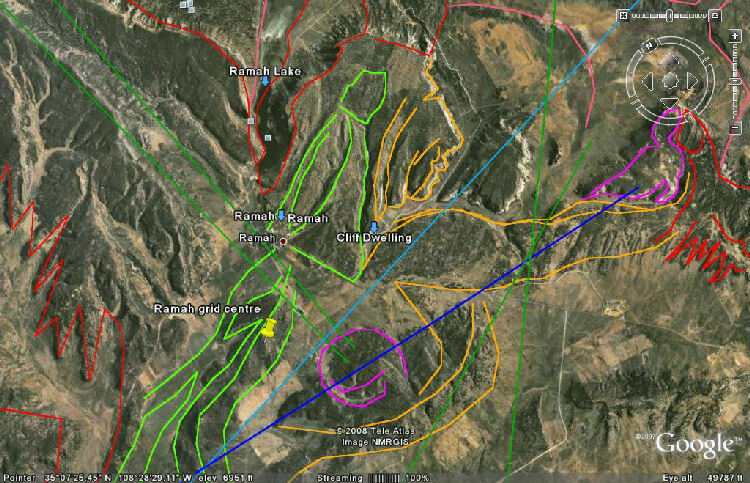 This larger area is the "City of the Risen" in the Reshel Bakhira Grid that locks onto the 1st Templa Mar in the Pine area on the Mogollon Rim. The Bakhira Grid is one of several major themes in the Sept. workshop at Trinity Point. It might be possible that this is a grid addition that facilitates the unification of the "City of the Risen...winged?" area. 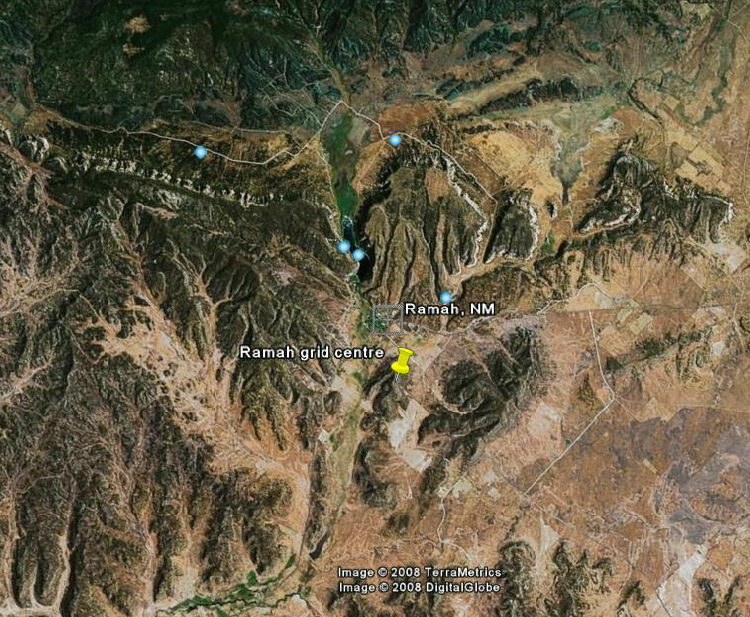 Google Earth file: RAMAH ANGEL.kmz. Shows the "Green Man" image of a winged native holding a Child/Skull/Head. The Child has been given a wing. (Note the wing reference at the end of Storm Waters notice below: "And if there's one thing I could do for you... I'd make you an angel's wing in Heaven Blue." This is a new World-Soul appearance of importance; it works as a crop formation would but this is a larger download. The Wing/Feathers spiritual dynamic is previously found in the Egyptian Dendera temple ceiling (feathered crown) and the Judeo-Christian mysteries (Abara, bara-sheth bara, etc.). The Bakhira Grid.kmz shows the grid as coded on the Westford Knight stone from the 1398 CE grid reboot mission including the Ruta link at 49N, 29W. The principle native sacred areas are in the "City of the Risen" area of the Bakhira grid organizing this side of the Planetary/Racial "brain." http://www.shameer-orion.org/pdf/Knight02b.pdf Knight carved in stone, 1398 CE mission. Eastern seeding codes in the Arkhom (Gamiish) Grid. Arkhom powers up the Bakhira. This schematic is the north western half of the Bakhira grid. Rebooting anticipated the formation of the IROQUOIS CONFED. and the creation of nations needed for the Ascension and expansion of the World Soul right brain. This Plan has existed many thousands of years. The Marmre Icarus Azalah Grids.kmz shows the World Soul (Gaia/Racial Mind/Soul) forebrain systems: Icarus grid prior to the 9-11 generation of the MESSIANIC GRID and Azalah grid forebrain expansion needed to ground and process the Messianic system (note significance also of the Gulf War(s)... previously commented on). Your seeing the object being carried as a skull and/or head, my seeing it as a new child, are connected with the New Race/DNA as working via the Chief Head Stone (symbols: decapitated Head, the skull being the same but relating to this Continuum reality, created to form the New Race/DNA). The Lion connection, in THAT context relates to Leo and Mazuriel as the power, function within Leo. The Lion relates to the Edinburgh Pole and the Child to the Glastonbury Zodiac: http://www.shameer-orion.org/pdf/GridGlastonNoachOrion01.pdf note the Glastonbury Child in Noach's Ark. There is a vital Templar mystery involved and one that is timely as of this last month and the Rosslyn Heart-Stone direct line to the Hawaiian Roil/Royale pole on 21 June. TEMPLAR HEAD AND NUMBER "1058": I've commented before on this number carved on a silver woman's head. I've also seen the number on the physical full moon as a vision in the physical, it stayed very stable for about 15 minutes. Earlier I saw the woman's head on a non-physical full moon; this was a part of a "Dweller on the Threshold" (Lillith) function... this sometimes kills people, it almost did me. Usually the DotT event is intense but not that much; also it can last centuries if large units of the World Soul are involved... same event but different levels. A male and female moon are involved in the physical as well as non-physical. The "58" spells Noach in one direction and Chen (Grace) in the other but all 3 chen-forms are implied. (NOACH and NOT "Noah") Gen 9:11-29 is critical to Templar knowledge and function but it has to be translated and the metaphysical meanings used. We are presently (our Crestone group and Carol's Ark work included, in Wyoming) involved in finding Noah and the Ark/Arc involved in advanced Ark work and systems. Apparently the Sinclair Templars knew this, that we are presently rediscovering and being told about, but probably upgraded. The "ARC in the CLOUD" is basicaly the Cloud as formed with the Ark and the Arc within it is the Nuur (Bethlehem) angle cup or arc as used in the Reshel and presumably in the Sinclair Arms/Shield.